brianv wrote: Hohoho. I see by looking out my window that there's a finger-nail moon and on the solstice too, I wonder if the elves and goblins have something planned for us! Hehe, dear brianv... dunno about the elves and goblings, but methinks that the moooon and its swirling companions might be planning a cosmic dance party for us! You don't often make typos Simon, but goblings? Sure! Duck is to duckling and goblin is to gobling! Speaking of which, aren't there a number of fantasy and [fill-in-the-religion]-fiction writers out there working on getting CluesForum understandings into the public imagination? Does anyone reading this forum work for Hollywood and want to try their hand at using their connections as a platform for truth about how it all works, for once? You don't have to answer if you're casually reading anonymously, but how about a Christmas present to the public and push for some real stories of Hollywood-military-space industry collusion? Would the public believe it if they saw it? Would actors be able to handle truth about themselves, or is it something they prefer to downplay because it smears the public image of what the illusions of celebrity stardom are? You know, "scandal" sells too! And what's more gossipy than the things big celebrities constantly try to push away from their consciousness, unbeknownst to the adoring public? Just putting that out there. If we actually notice such things, we might mention them in some other topic, as this one is about our own membership's efforts. But, worth asking for. 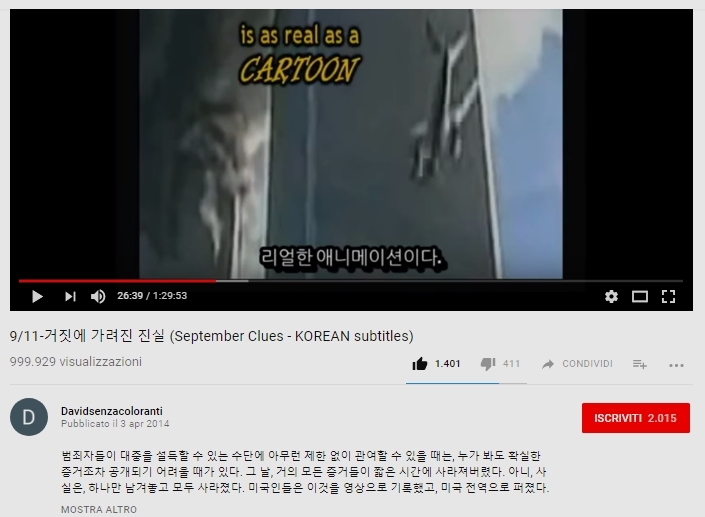 Today I'd like to salute the Korean people - and more specifically, all Korean September Clues viewers! All 999.929 of them ! As it is, the Korean version of SC is the first ever SC video to reach the 1 million-viewer mark (as it hopefully will do today). Please know that the Korean version was yet another heroic effort by Hoi Polloi back in 2013/2014, as he stayed in Korea for several months and, with the (obviously crucial!) help of a Korean friend*, performed the beautiful translation / subtitling. 환상적인 직업! *Dear Hoi, I'm afraid I can't remember his name. Let us know - and please transmit my warmest thanks to him once more ! That's amazing news! Maybe now the Koreans will understand that - 너는 바보 취급을 받는다. I'm going to watch my favourite Kung-Fu Movie tonight in celebration. He qi dao. 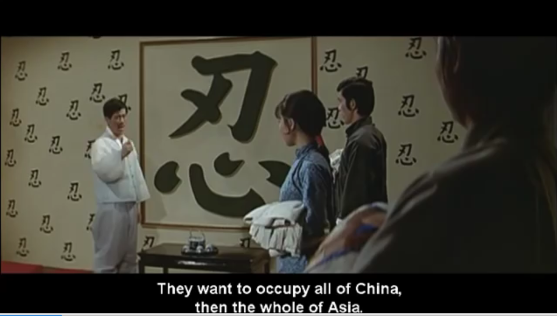 (Hapkido 1972) Starring Ji Han Jae, Angela Mao and Sammo Huang, with several stunts/appearances by a youthful Xiaou Qi Chan (Jackie Chan) Whyahhhh! This message is rated highly on the channel and refers to the Apollo moon landings being part and parcel of the same hoaxers that captured the U.S. regime. It is encouraging. Oh, well. I guess it's the same in every country. Some are willing to understand. Others not. The author of the subtitles wished to remain anonymous, and I understand. Every time I come across him I thank him again for his stupendous work. hoi.polloi » February 22nd, 2018, 6:32 am wrote: 1 million and 37! I expect a few of those are Stockholm Syndrome or Uncle Tom Syndrome. I mean after all, Donald Trump is now the President of the USA. What does that tell you? How does the initiation of force make for an honest group of people, whether they call themselves a government, or go by some other name? The very act of running for office can be construed as an attempt to coerce others, a violation of their fundamental right to self-ownership and freedom from violence. In that light, even the ‘best’ politicians are thugs. No I won't let you apologise. How dare you come here and make accusations. And just to let you know, that your block posting which quickly scanned over reveals, US Government, America, USA American Government, Drill, USA,U.S American MSM, tells me all I need to know about you. Avoid like the plague! Human beings have been domesticated over hundreds if not thousands of years. They are no longer capable of or even interested in overthrowing their masters, who have done this to them intentionally and systematically and who control nearly everything that they think and believe from the moment they are born. One of the biggest reasons that people are so incapable of questioning what they are told and so hostile to those who do is because over the last thousand years or so most of the people who dared to do so were murdered and did not reproduce. PianoRacer » March 3rd, 2018, 5:13 pm wrote: They can never have the treasure that we possess - a life lived honorably and a clean conscience when we shuffle off this mortal coil. Personally, I wouldn't trade those things for all the money and power in the world. I've said it before: Our forum is the single most important website in the world.